Why do we apply Neuro-Linguistic Programming (NLP™) in accelerated golf lessons? Philip Ang is a certified Neuro-Linguistic Programming (NLP™) practitioner by The American Board of Neuro-Linguistic Programming - USA and the one and only golf coach in Singapore that utilizes NLP™ technique coupled with Golf Psychology and Golf Sport Science to facilitate and enhance students' performances in golf swing learning and game improvement. What NLP™ can benefit you and in your golf improvement? Neuro-Linguistic Programming (NLP™) is one of the most prevailing and powerful technologies today in the field learning, improvement and achieving peak performance for our profession and vocational skills. It changes our attitude and aptitude towards our skill acquisition. NLP™ can help you see immediate tangible reward in what we are doing. Surface the evidence of our efficiency and effectiveness performance, including learning golf swing and game improvement technique. NLP™ focuses on discovering HOW people are good at what they do and how they produce excellent results consistently rather than WHY. For over thirty years NLP™ explorers have studied or ‘modelled’ the thinking styles, behaviors patterns and communication technique of exceptional and successful people in business, education, sales, sport, therapy and all forms of personal development. All successful professionals and sportsmen in any vocation possess unique quality to achieve their goal in one exempt as well as master complex skills in a very short time duration. They all have their special and signature strategies toward their excellence. A wide range of special technique from NLP™ have been developed and created from these professional success skills, strategies, methods, tools and models so others can skillfully duplicate the 'know-how' of the best in any given field. A powerful discipline of what NLP™ called ‘modeling’ is a key feature that distinguishes NLP™ from psychology. Many sport psychologists today studied and applied NLP™ to enhance their vocation skills. Top sports performers like Tiger Woods, Andre Agassi, Greg Norman and Andrew Flintoff are just a few who uses NLP™ regularly to achieve the outstanding results they do. By using NLP™, they have stretched and grown into their full potential with outstanding achievement and their awesome self-belief inspires others. At some points of their career they did whatever it takes to become extraordinary including exploring and applying NLP™ to what they do best. World leaders and celebrities who studied and applied NLP™ are Bill Clinton – formal President of United States, Anthony Robbins – World number 1 Motivation Coach, Tony Blair - formal Prime Minster of England. Oprah Winfrey just to name a few. Many blogs suggest that Barrack Obama – President of United States uses NLP™ too. How Neuro-Linguistic Programming (NLP™) can accelerate your learning? Neuro refers to the nervous system through which our experience is received and processed through five senses namely: Visual, Auditory, Kinesthetic (tactile touch or emotional feeling), Olfactory (smell) and Gustatory (taste). We take in information through these 5 senses. In golf when learning the golf swing technique, you should use your eyes to observe (visual) how the club swings and hit the ball proficiently to produce a particular ball flight outcomes during demonstration. You need to listen (auditory) to the golf coach giving you the clear instructions on how to stand, hold the golf club in your hands correctly. You need hands-on and experiential learning (kinesthetic) of the golf swing technique. You may want the coach to teach you the kinesthetic senses in your body muscles for the golf swing action. NLP™ technique teaches how to use your dominant senses for accelerated learning to register your learnt golf swing knowledge, skill and attitudes so that you can evoke them for your practices and plays. Linguistic relates to language and nonverbal communication systems through which neural representations are coded, ordered and given meanings. This includes pictures, sounds and feelings (tactile and emotions), tastes and smells and the words used in self-talk. In golf swing technique application, you learn how to master your golf swing technique by creating pictures of golf swing components, develop the tactile sense of hands on the golf club's grip during golf swing action. You need to develop kinesthetically the muscles tension on each part of the golf swing components. Learning the NLP™ sub-modalities technique and Neuro Internal Representations can help to register and installed each part of the golf swing components physically and mentally to facilitate repetition of the proficient golf swing action. Your mind and body must also communicate effectively when making your golf swing action. What you say to yourself will manifest in your golf swing action. You cannot not to communicate for your intended golf swing action. What you need to learn is your ability to utilize the correct words and mnemonics related to your golf swing activity to enhance the consistency of your proficient golf swing. This NLP™ methodology helps to evoke success to accelerate mastering of golf swing technique within your athletic and physical ability. You will use this NLP™ golf swing technique acquisition tools that you have cultivated for your future golf swing application. You can see an immediate result to your golf swing action successfulness producing desirable outcomes. 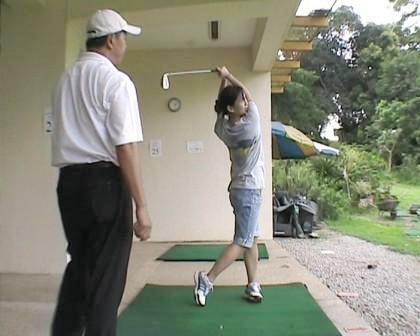 You will also be able recreate your linguistic tools to enhance your golf swing reality. Your initial stages of learning and mastering the golf swing technique will at conscious level. With more practice, your linguistic application will become sub-conscious. Programming refers to strategies, habits, routines and patterns. We organize ideas and actions to achieve specific desired results and goals. Often we find that we use the same patterns repeatedly. Once a pattern is learned the brain will continue to use it until something different is programmed (learned). The idea here is to reproduce the programming behind success, excellence and performance of those who stand out from the ordinary to become extraordinary. In golf, successful golfers with playing experience should have many and different 'programme' installed in their mind and body. The 'programme' are use for their practice session similar to the way the golf game is played; correct warm-up routine, golf swing and putting technique performances just to name a few. Every shot performance has positive intention. All your installed 'programme' require your mind and body to perform a desire psychological outcome. A pre-shot programme may take less than 30 seconds but it is paramount to a successful golfer. NLP™ Anchoring technique is a very powerful tool for every shot preparation be it your tee-shots, pitching, chipping and putting to enhance your composure, confidence and focus in golf swing execution and shot performance. If the created 'programme' serves you - generate positive results - great! If you find that some programme do not serve you, you can change by recreate a useful 'programme' that you feel comfortable to work with. To be a proficient golfer in short duration, golfers must copy the golf activity 'programme' of the elite players. My experience tell me that golfers only elicit the importance of warm-up when they attend major tournament to see idol tour players spending approximately 2 hours at range before their tee time (game starting time) and was even surprised to see them cooling down after the game at the range. NLP™ was originated by John Grinder (whose background was in linguistics) and Richard Bandler (whose background was in mathematics and gestalt therapy) for the purpose of making explicit models of human excellence. Their first work The Structure of Magic Vol. I & II (1975, 1976) identified the verbal and behavioral patterns of therapists Fritz Perls (the creator of gestalt therapy) and Virginia Satir (internationally renowned family therapist). Their next work Patterns of the Hypnotic Technique of Milton H. Erickson, M.D. Vol. I & II (1975, 1976) examined the verbal and behavioral patterns of Milton Erickson, founder of the American Society of Clinical Hypnosis and one of the most widely acknowledged and clinically successful psychiatrists of our times. As a result of this earlier work, Grinder and Bandler formalized their modeling technique and their own individual contributions under the name "Neuro-Linguistic Programming" to symbolize the relationship between the brain, language and the body. The basics of this model has been described in a series of books including Frogs Into Princes (Bandler & Grinder, 1979 ) , Neuro-Linguistic Programming Vol. I (Dilts, Grinder, Bandler, DeLozier, 1980), Reframing (Bandler & Grinder, 1982) and Using Your Brain (Bandler, 1985). Through the years, NLP™ has developed some very powerful tools and skills for communication and change in a wide range of professional areas including: counseling, psychotherapy, education, health, creativity, law, management, sales, leadership and parenting. 1. If you always do what you always did….you always get what you always got. 2. What are your Internal Representation (IR) of your golf swing action? 3. The map is not the territory. 4. There is no failure, only feedback. 5. If one person can, anyone can. 6. You cannot not communicate. 7. The meaning of your communication is the response that you get. 8. Every behavior has a positive intention. 9. Most learning and change takes place at the sub-conscious level. 10. People already have all the resources they need to change. 11. Whoever has the most flexibility has control of the situation. 13. Your behavior to the outcome is more important than the outcome. The great reality of NLP™ is if one person can do something, anyone else can learn how to do it. Human excellence can be systematically studied then reproduced. Just as you can learn to swim, drive a car or use a computer, so too can you learn and apply the core achievement skills you need to become outstanding in your profession and playing golf efficiently. My students have benefited from my NLP™ golf coaching and so can you. "Neuro-Linguistic Programming (NLP™) is the modeling of excellence,"